Pearl You has 19 years of experience in the bilingual language education field both as a teacher and as an administrator. 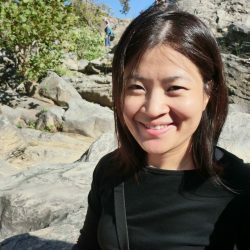 She started as an English Lead teacher in Guangzhou ChaoTian Primary School in August 1998 and moved to Washington D.C. to become a Chinese immersion lead teacher in January 2010. In the last 7 years, she took on the leadership role as the Chinese Program Coordinator at Washington Yu Ying PCS. In this capacity, she led the Chinese teaching team and implemented training sessions in immersion planning, teaching as well as the development and delivery of the curriculum. In the past few years, she successfully led the Yu Ying team to plan and implement Level Chinese within Yu Ying’s IB-PYP & Chinese Immersion curriculum model. In 2017, Pearl founded You Consulting LLC. You Consulting provides consulting services for dual language programs all over the world in the areas of curriculum design, professional development for teachers as well as Level Chinese planning and implementation. She has consulted at a number of schools such as Washington Yu Ying PCS in D.C. , Daystar Academy in Beijing, Westside Elementary in Maryland and JNAS in Zhejiang Province. She hopes to use her years of experience to support and work with teachers and administrators to elevate the level of Chinese dual language programs all over the world. Please join the Level Chinese WeChat group by contacting Pearl. Her email is pearl.y@youconsultingllc.com and her WeChat is mermeid88. 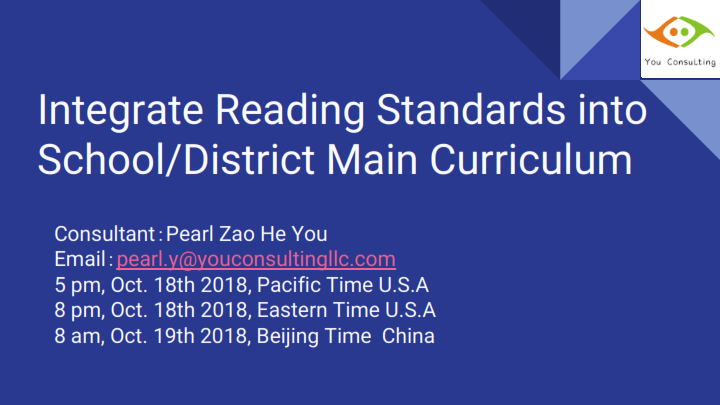 During the school year 2018-2019, Pearl will present, through a series of webinars, the step by step process of how to integrate reading instruction into your main curriculum for whole class instruction as well as small group instruction. Every webinar will be held at 5 p.m. PT. Webinar recording will be posted on this page 1-2 days after the webinar has been held. Why Integrate Reading Standards into Main Curriculum and How to Unpack Reading Standards? In this webinar, Pearl discussed the importance of “Reading Standards”. She used three different levels of planning process for discussion. These examples included a standard-based Read Aloud by Pearl, Reading Curriculum Map shared by Denver Language School and Steps of Preparation for Reading Curriculum Mapping. You can download slides and completed skill checklist presented in the webinar. 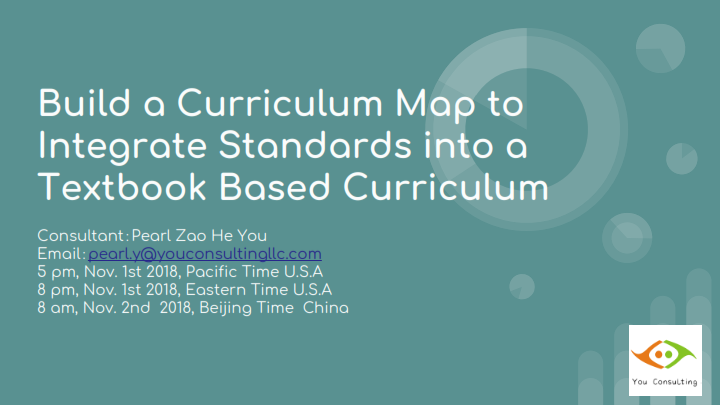 In this webinar, Pearl discussed with teachers how to identify “Reading Objectives” based on students’ level using Level Chinese assessment data, integrate reading standards into textbook Read Aloud and flexibly use Better Immersion passage to build students’ language/reading foundation in order to connect and support deeper social studies learning. A snapshot of curriculum mapping, sample reading lesson plan using textbook story, ways of structuring literacy stations/small group Read Aloud lessons to enhance reading comprehension and fluency are also shared by Pearl and Denver Language School to support this discussion. 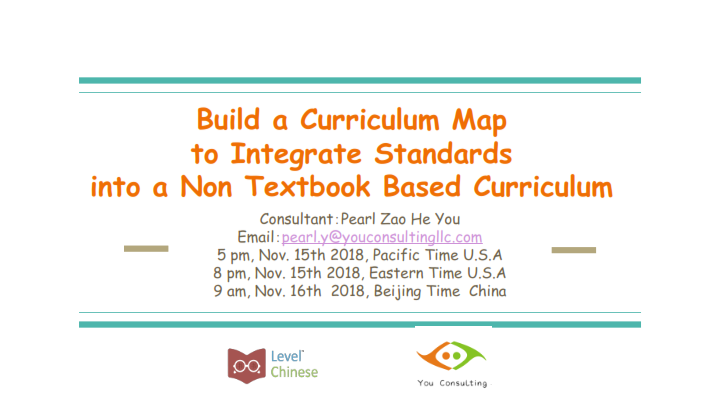 In this webinar, Pearl shared the common challenges in implementing Non TextBook Curriculum and the suggested solutions to address these concerns when planning and integrating language and literacy within content learning. She discussed with teachers how to realistically plan out social study units based on students’ proficiency level，how to differentiate the instructional material and activites to balance content and language learning especially when there are students with multiple reading levels in the same class, and how to identify appropriate reading objectives to integrate into content related Text(A Nonfiction Book) Read Aloud to further support Social Study Unit. A snapshot of curriculum mapping, curriculum resources and sample reading lesson plan using appropriate content related text are also shared by Pearl and Braddock Middle School in ACPS Maryland to support this discussion. In this webinar, Pearl discussed with teachers why setting up a reading routine is so important and how to implement reading routine consistently in early childhood classrooms. Through observing a Kindergarten interactive read aloud lesson, using Level Chinese resource, taught by Eve laoshi at YuMing Charter School in CA, teachers are able to see what an interactive read aloud looks like. After the observation, teachers discussed and learned what early literacy skills and strategies can be used to plan student learning effectively. You can download slides presented in the webinar. 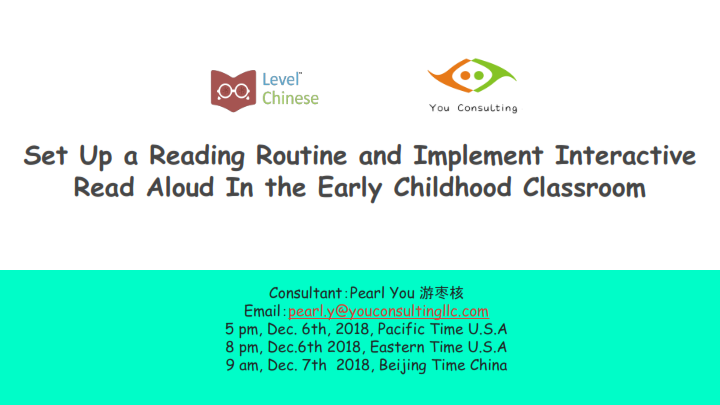 In this webinar, Pearl discussed with teachers what Chinese ‘Interactive Read Aloud’ looks like in the lower elementary classrooms. 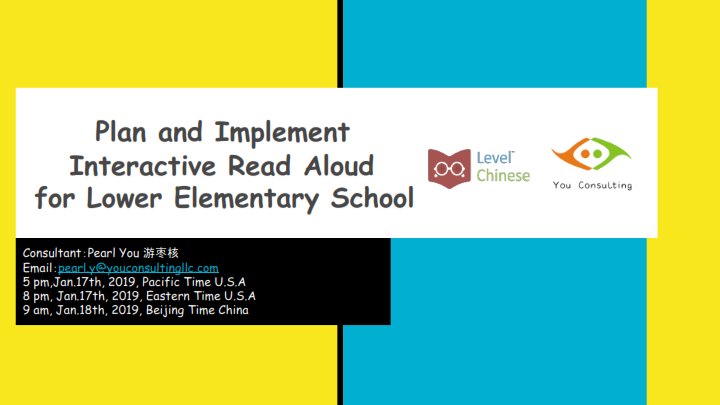 Using students’ most recent Level Chinese assessment data, Pearl and Hu laoshi at John Gill Elementary School in California, determined the read aloud book which would be appropriate for students’ instructional level. Through intentional planning of the Level Chinese Informational Text reading standards, Hu laoshi implemented an Interactive Read Aloud lesson. During the webinar, teachers saw Hu laoshi used a Level F nonfiction book (Simone Biles), modified biography graphic organizer and scaffolding reading activities and strategies to support students understanding. Hu laoshi reinforced the language and concept of the current history unit and built comprehension of this Read Aloud Book . After the observation, teachers discussed and learned what skills and strategies can be used to plan for and implement Lower Elementary Read Aloud effectively. 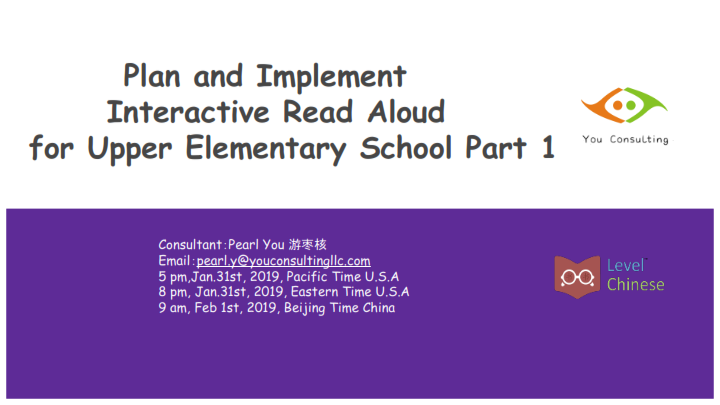 In this webinar, Pearl discussed with teachers what Chinese ‘Interactive Read Aloud’ looks like in upper elementary classrooms. Pearl collaborated with Huang laoshi at John Gill Elementary School in CA. Huang laoshi used Level Chinese assessment to determine Level H is the appropriate instructional level of her 3rd grade students. Pearl and Huang laoshi selected the Level H fiction book (Sports in Summer) as the read aloud book. Through intentional planning of the Level Chinese Fiction Text reading standards, different levels of reading activities were designed to support students’ comprehension at the Read Aloud lesson on Day 1. These activities include engaging students in discussions using “Prediction” with sentence stems of “I see… and I predict…”, “Picture Walk” with sentence stems of “I see…, I think, and My question is…” , and modified fiction graphic organizer for getting information about when, where, who, characters’ points of view, story conflict and resolution in the book during the “1st Read” by Huang laoshi. During the webinar, audience saw classroom video of Huang laoshi instructing to the plan. After watching the classroom footage, the audience discussed the skills and strategies used to plan and implement Upper Elementary “1st Read” focusing on reading comprehension effectively. 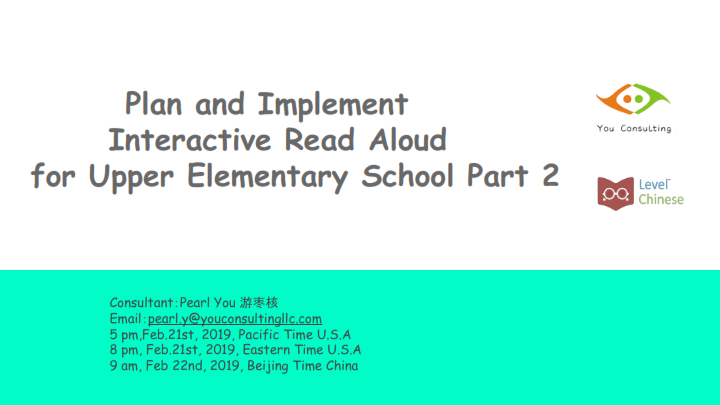 In this webinar, Pearl continued to discuss with teachers what Day 2 Chinese ‘Interactive Read Aloud’ lesson looks like and continued to discuss in upper elementary classrooms . After 3rd grade students had general understanding of the Level H fiction book (Sports in Summer) in the First Read lesson in the last webinar, Pearl and Huang laoshi from John Gill Elementary School selected Level Chinese Fiction Text reading standards and implemented appropriate reading activities to explore deeper comprehension with her students. Role play was also introduced and practiced in the end of this lesson to make more connection with building students’ independent reading. After watching the classroom footage, participants discussed the skills and strategies used to plan and implement Upper Elementary “2nd Read” more effectively.